Velo Lumino now sells SP dynamo hubs! Up to now, Velo Lumino has been selling only components and parts that we design and fabricate ourselves (ourselves being Anton and Tom for the TMAT switch, and Anton for the AT fender taillight, AT headlight mount and AT fender reinforcement plate). 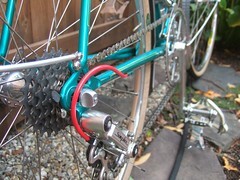 But our ultimate goal is to offer a complete line of top-flight bicycle lighting and integration components. Some components are too complex for a two guys to design and manufacture– such as generator hubs, which are the heart of a truly integrated lighting system. 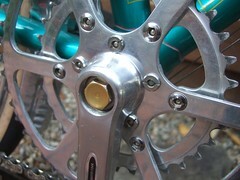 To that end, we’ve become a retailer of the excellent Shutter Precision dynamo hubs. 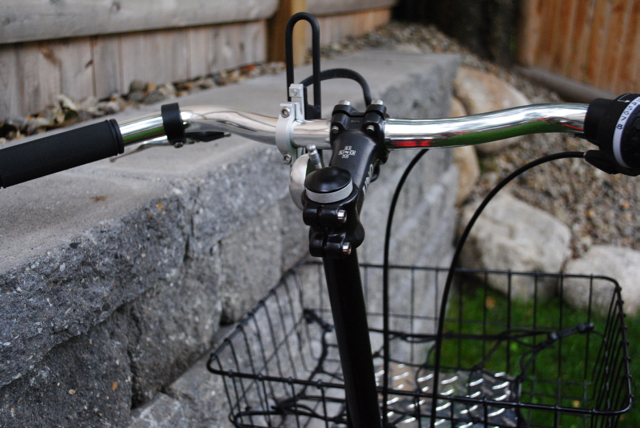 SP is relatively new to the dynamo hub scene, but have gotten excellent reviews and have been making quite a splash in the dynamo community by raising the bar for efficiency, weight, size and reliability. Since before becoming a retailer of SP hubs, I’ve owned two, and I’ve been extremely satisfied with them (granted, I’ve had them less than a year). One is on my daily rider, which lives outside and has been ridden throughout the winter. 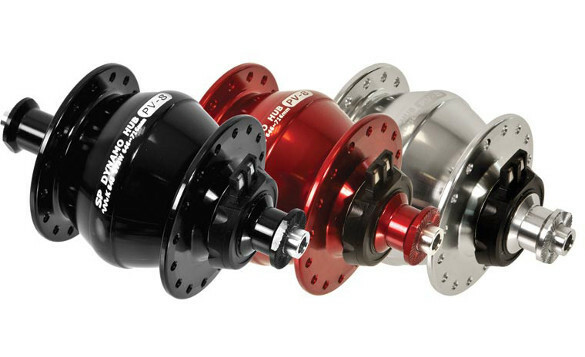 SP hubs come in a wide range of models, spoke counts, and colors, and their naming can be confusing. 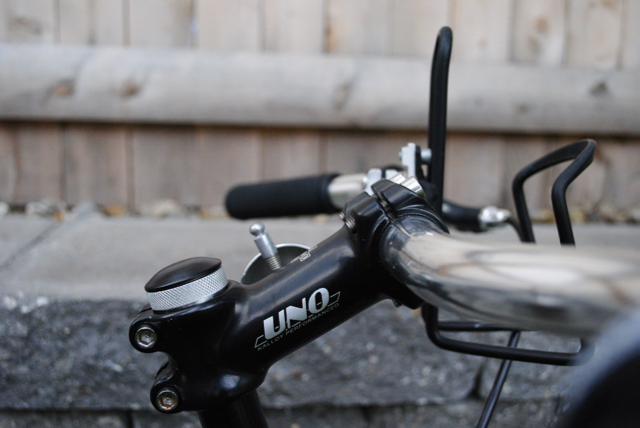 I demystify the naming convention on the Velo Lumino product page, and explain how to order the right hub for your needs. Polished AT fender taillights are back in stock! We had sold out of our first batch of polished AT fender taillights, but we are now restocked with them and all other Velo Lumino components and installation parts! 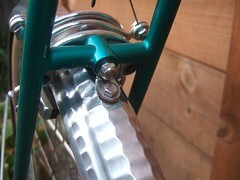 AT fender taillight on a recent Chapman Cycles build. 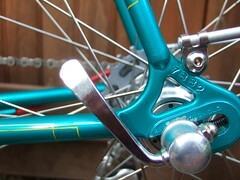 Photo courtesy Chapman Cycles via flickr. AT fender taillights in polished finish: temporarily sold out! We’ve sold out of our first batch of polished fender taillights. We still have stock of taillights in brushed finish, as well as AT headlight mounts and TMAT stem switches. We are working on batch #2 of polished taillights and should have more available by this time next week. The polished AT fender taillight has proven popular! If anyone has an interest in a one-off surface finish other than polished/brushed (color anodized, perhaps? ), shoot me an email. It’s possible to do custom one-offs now and then, especially when in assembly mode. 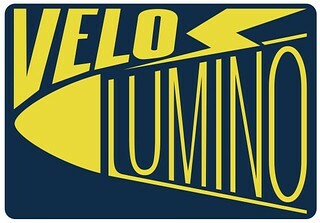 Thanks for all the interest, and faith, in Velo Lumino components! 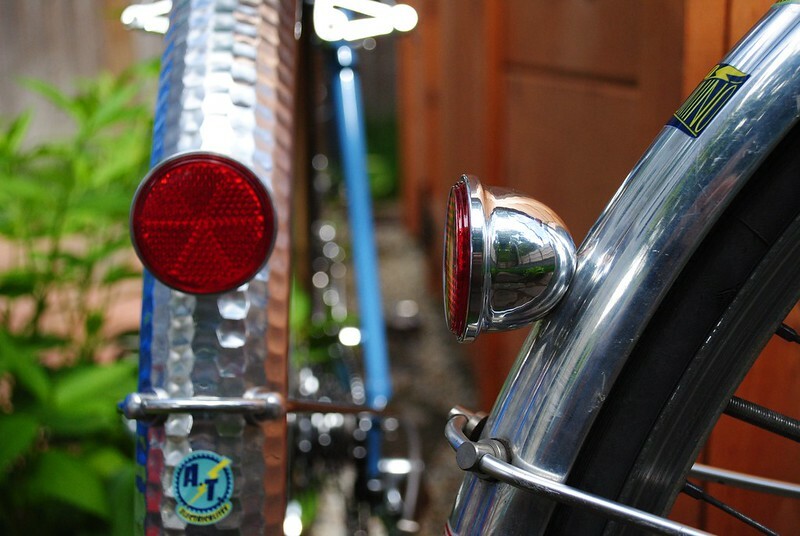 I ordered a polished taillight from Velo Lumino for a customer’s Velo Orange Polyvalent 650b bike. Before ordering it, I received several prompt and informative emails from Anton about the light assuring me it would work with customer’s dyno hub and complement front light. The light arrived very well padded with well thought out instructions, while the light, lens and overall design has a well executed presentation to it. 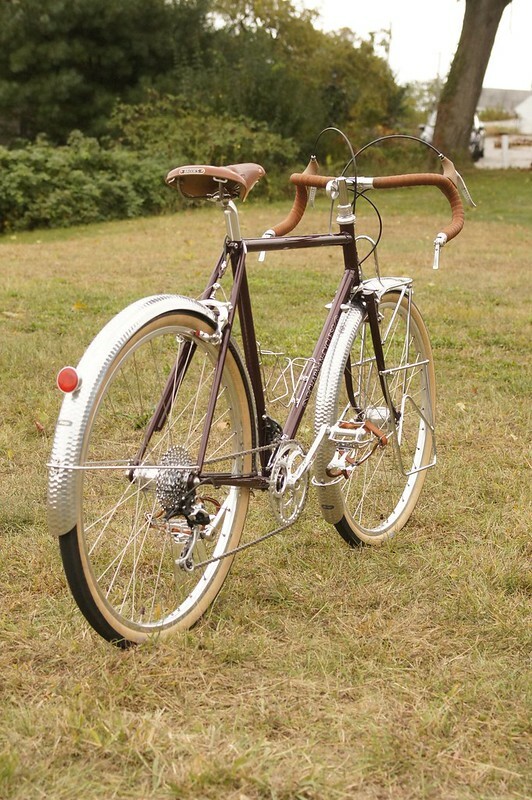 It compliments the style of my customer’s bike and personal taste. Wiring was easy. Light sits properly on the rear fender after a quick drilling of the hole to secure the light. Customer has only used it 3-4x on a 40 minute roll home and says he is very pleased with the light as it offers much brightness in a small package while ensuring clean aesthetics… Congratulations to Velo Lumino for a nice product! I would highly reccomend Velo Lumino products for their thoughtful, high quality and good designs and prompt courteous service. Thanks, Bob! That makes our day! You’re invited to the Ball! The New England Builders’ Ball, that is. We’ll be sharing a booth with our good friends at Sinewave Cycles. Come see both of us at booth #18, or just look for our logos. We’ll have all our components on exhibit for you to see and touch: the TMAT stem switch, AT fender taillight and the new AT fender headlight mount. Sinewave Cycles will have their excellent Revolution and Reactor dynamo-driven USB chargers. We hope to see you there! 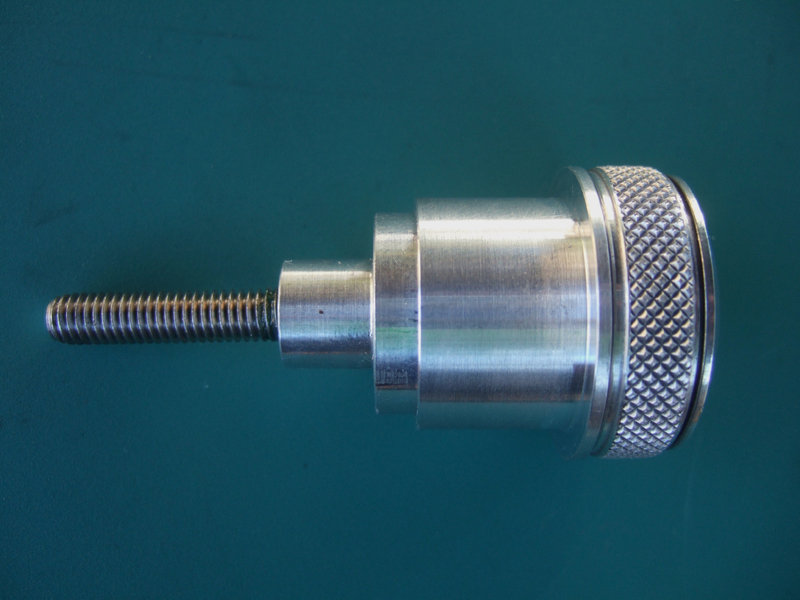 The TMAT stem switch adaptor for 1-1/8″ steerers is available! 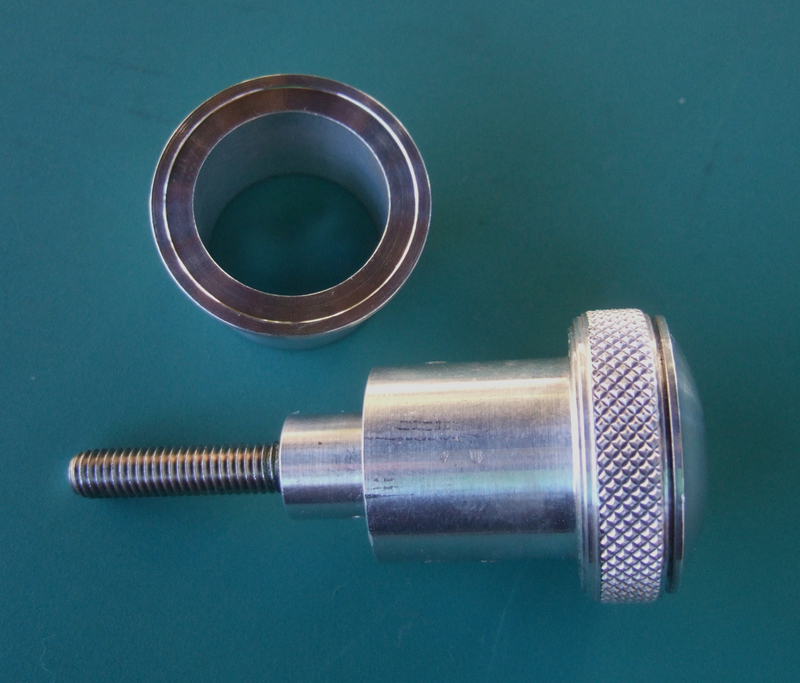 Velo Lumino is now stocking the adaptor necessary for installing the TMAT stem switch on bikes with 1-1/8″ steerer tubes. The switch was designed to work with 1″ steerers, with the idea that it could be made compatible with 1-1/8″ steerers via an adaptor if there was demand. Well the people have spoken, so we made a batch of these adaptors. The adaptor provides a perfect fit with 1-1/8″ steerers and stems, and adds only 1.25mm of stack height below the switch. With the adaptor, the switch preloads the headset and stem just like an ordinary stem cap, and the switch looks just as integrated as on a 1″ steerer. So for all of you who have been pining for the TMAT stem switch but weren’t able to take the plunge because of your 1-1/8″ steerer tube, you’re in luck! Available at velolumino.com. 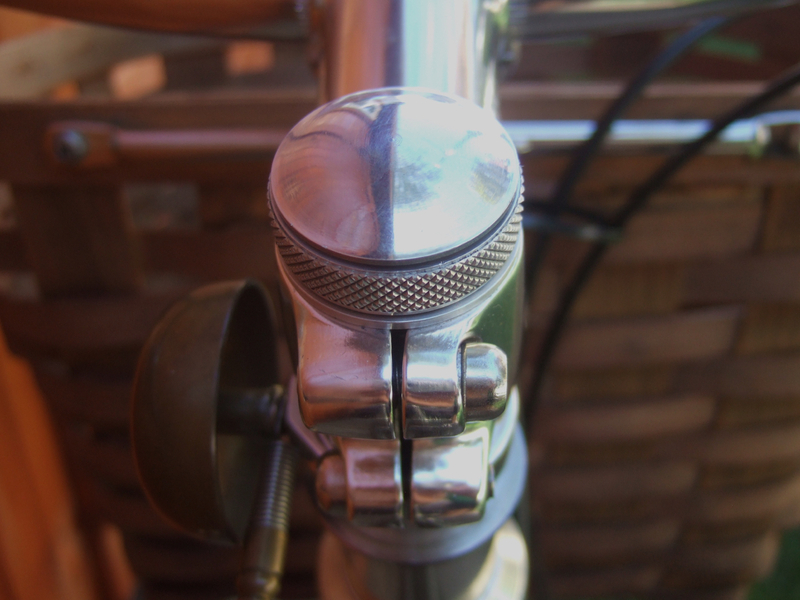 The photos below show the switch with adaptor on a bike with a 1-1/8″ steerer. One tricky place for wiring is between the fork and the frame, regardless if you are running the wire internally or externally to the frame. 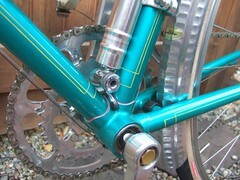 Unless your bike has a carbon brush in the steerer à la René Herse, the wire has to pass externally from the fork crown or the fender to a hole in the downtube. What’s more, the wire has to have slack in it to allow the fork to turn without pulling the wire. I’ve seen all sorts of solutions to this, but none of them are perfect. The best approach I’ve seen is a wire that coils like an old fashioned telephone cord. Most of the Installations I’ve seen this way get it wrong. You can coil wire around a pencil or something similar, but it won’t keep its shape: one pull and it the coil straightens back out. That’s because when wire is made, the plastic coating is melted on and fused while the wire is held straight and taut, and then cooled rapidly. So even when the wire gets wound onto a spool for distribution, the plastic has “memory” and wants to straighten. Depending on the formulation of the plastic wire wrapping, it’s possible to “re-train” it keep the coil shape simply by heating it enough but not too much– or it will melt. 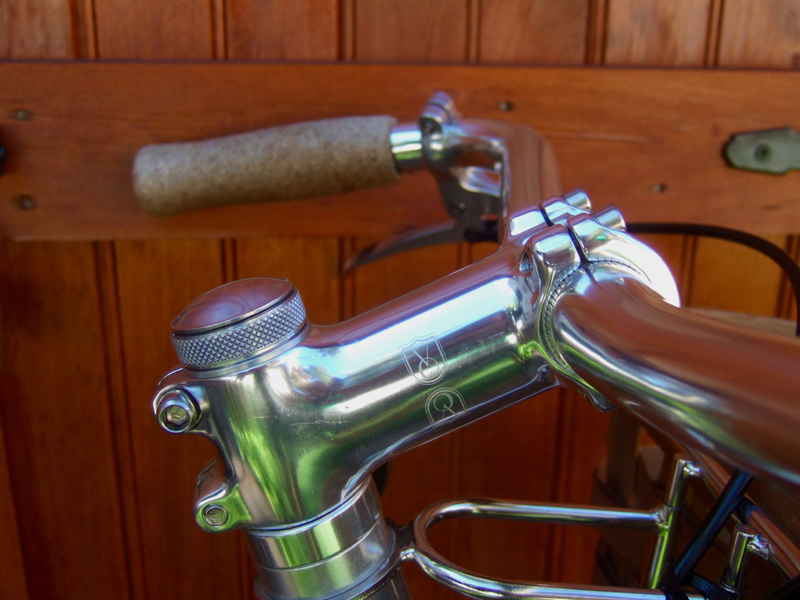 Here’s what you’ll need: wire, a narrow rod like a fender stay (you can even use one on your bike without removing it), and a heat gun (a hair dryer doesn’t get hot enough). 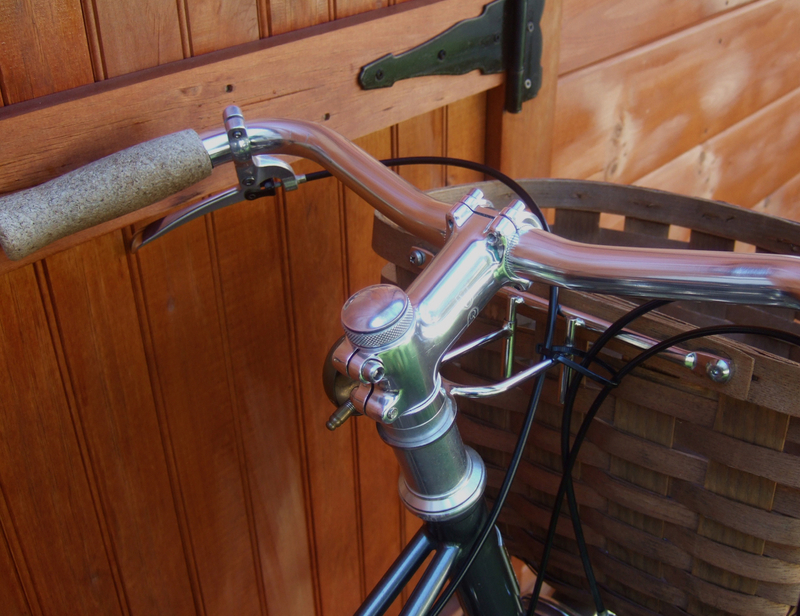 coil the wire tightly around a narrow rod, like a fender stay (you can even do this on the bike!). Pencils and pens are too thick (and pens might melt). hold the ends in place or tape them in place so the coil doesn’t unravel when you let go. use the heat gun to heat the wire evenly– test a small piece beforehand to make sure it doesn’t melt. allow the wire to cool. Sometimes cooling it rapidly by running it under cold water for a few seconds helps the wire learn its new shape. Voila! You’ve now got a coiled wire that will remember its shape even after repeated stretching. Note that not all wire can be “re-trained” this way, but the premium 22AWG wire that we sell works well for this trick! If you’re having a custom bike built or having your bike repainted, you can ask the painter to paint match the cover to the bike! Our components accomplish simple tasks– closing or opening a circuit, or shining light. But they need to perform their tasks reliably. 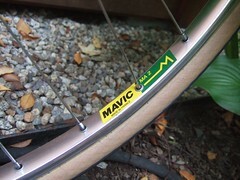 They will work on any kind of bike whether a city bike or a bike designed for long distances, but it gives us particularly great satisfaction to know that some long-distance randonneurs are trusting our lighting components to keep them safe and seen through multi-day brevets and other endurance rides which take them through the dark of night. In these endurance events, riders can’t afford to be let down by failing components! 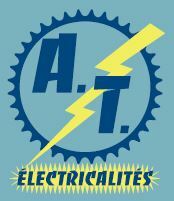 Two of our earliest customers, both accomplished randonneurs, will be staying lit with the AT fender taillight through the long nights of the most famous randonnée ever, the 1200km Paris-Brest-Paris which starts in two days! We couldn’t be more proud and we wish the PBP riders a safe journey! 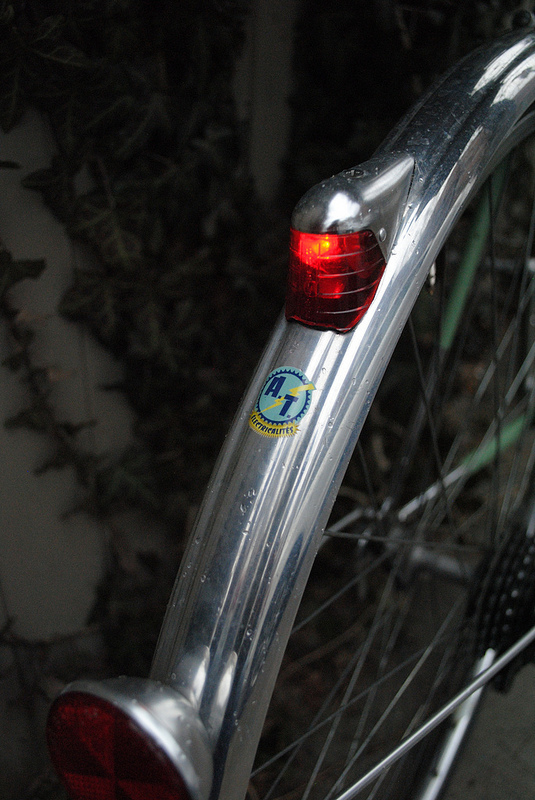 Proud to introduce the new Velo Lumino seat tube taillight! Available now on velolumino.com. 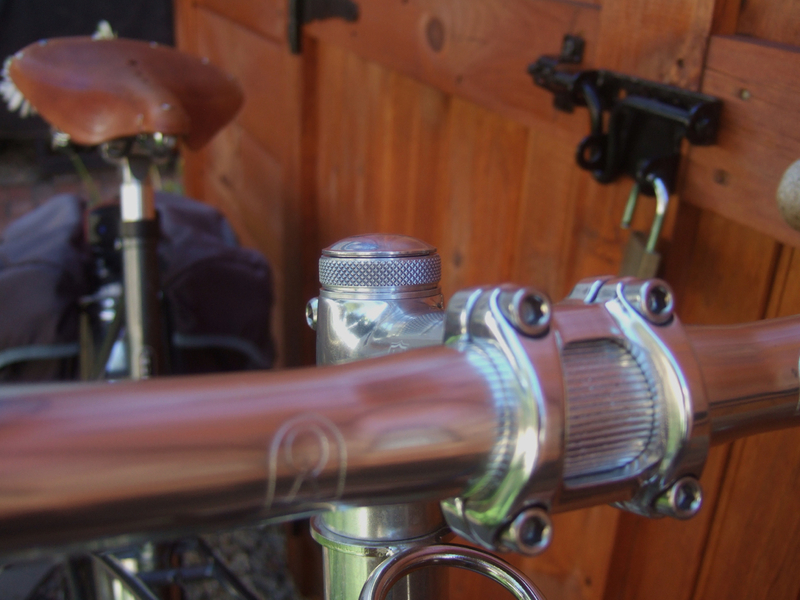 Simon of Hanford Cycles added a truly one of a kind artistic touch to a TMAT stem switch: an inlaid six pence coin. This is exactly the sort of thing I hoped builders would do with the blank cover that comes with each switch!